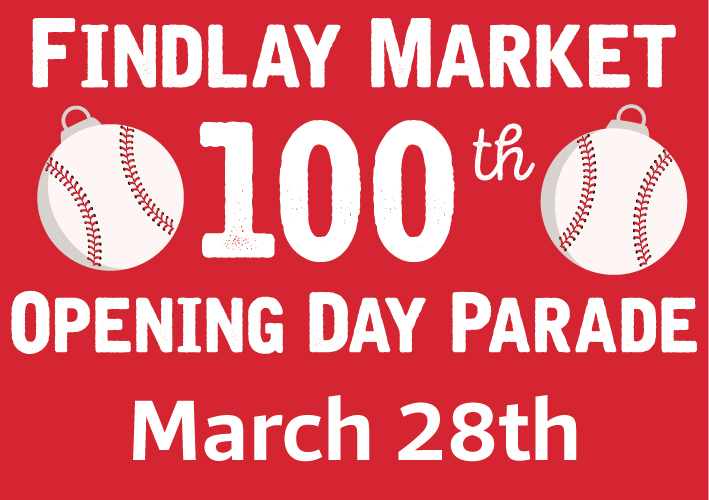 Cincinnatians love baseball, and Findlay Market loves the Opening Day Parade! This year is the 100th Opening Day Parade! Come celebrate this historic milestone by showing your love for America's favorite baseball team. There will be floats sponsored by local businesses and organizations all across Cincinnati, festive activities, Cincinnati chili and, of course, America's favorite pastime--baseball! Get down to the Market early to enjoy a beer and some delicious local food while the parade sets up around you, or line up along the route to cheer. The parade will officially kick off at noon. Commemorative 100th anniversary parade ornaments and posters are being sold in honor of the big day. Purchase yours at the Market Center while supplies last!